Nail surgery is a procedure carried out to treat painful toenail conditions such as ingrowing, thickened or involuted nails. Firstly, patients are made comfortable and asked to sign a consent form. A local anaesthetic is then administered to the affected toe(s) to make it numb. The procedure will not proceed until we are sure that the patient can feel no pain. The toe(s) is cleaned with an antiseptic rinse and a tight rubber ring applied to the toe(s) to prevent excessive bleeding during the procedure. 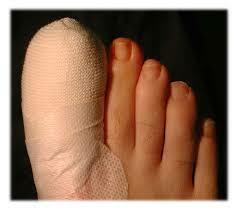 The procedure is carried out to remove either a part of, or in some cases, all of the painful toenail. During the procedure, patients should expect to feel pressure but NO PAIN. Once the section / whole of the toenail is removed, a chemical is applied to prevent unwanted painful regrowth. A sterile dressing is then applied. Patients are allowed home approximately 10 minutes later. Patients should rest as much as possible for the first 2-3 days after surgery and keep the dressing applied dry and in place. Patients are seen back in clinic approximately 3-4 days later. At The Accolade Clinic we screen all our patients carefully and discuss with you all the treatment options available. Should nail surgery become necessary, we will ensure you are completely happy with the treatment prior to undertaking this minor surgical procedure.